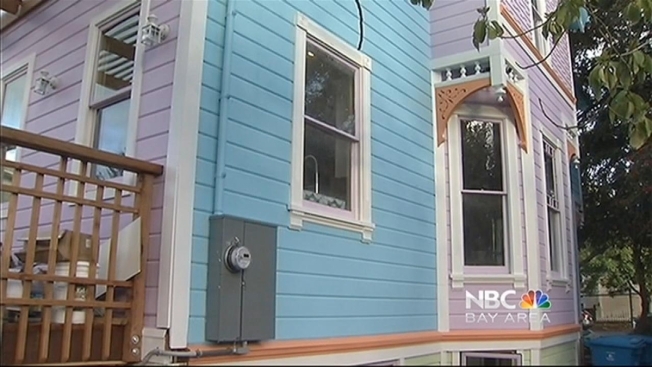 A Santa Clara, Calif., neighborhood is up in arms over a neighbor's decision to renovate an old Victorian to resemble the home in the animated movie "Up." Hosam Haggog and Fatima Rahman spent more than two years on the renovations of their home in the highly sought-after Old Quad neighborhood. "They love the movie 'Up' and we just thought we'd give them something fun to be proud of and actually all the kids in the neighborhood really love the colors," Haggog said of his daughters. But several adults in the neighborhood are not in favor of the bright colors. Harrison Street is the oldest street in Santa Clara with homes more than 100 years old. Many residents take pride in preserving the original look and style of their Victorians. "I don't think it fits in," neighbor Lou Faria said of the renovated Victorian. Faria, who also is a member of the Old Quad Residents Association, said the Haggog and Rahman should have kept to the historic theme of the neighborhood. "It really, in my opinion, is atrocious that this Victorian is a gracious old lady and it's being painted up to look like a clown," Faria said. Longtime residents feel the city didn't review the renovations plans carefully enough to prevent structural changes. But some now feel it's time to move on. "I like historical houses to be historical," neighbor Chuck Petersen said. "On the other hand, it's his home and I feel that sometime down the line it's going to be repainted again anyway." Rahman said there was no intention to spark drama over the renovation. "We're not trying to create controversy," Rahman said. "We're trying to build a home for our daughters and our family. And that's what our intention was."